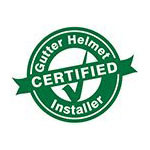 Advanced Home Solutions originally started as Gutter Helmet® of Kansas in 2000. We changed our name as we added more services for our customers. We have been serving the state of Kansas for over 13 years now and have since extended our service area to Oklahoma, including Salina, Oklahoma City, Tulsa and the nearby metro areas. We are a member of the BBB and are proud to have earned an A+ rating for our commitment to top-quality customer service. Since our establishment, we have installed Gutter Helmet® on thousands of homes and have produced some of the best installations in the country. Because customer service is our utmost priority, we offer our clients nothing but the best. This is why we are proud to be part of the professional dealer network for Gutter Helmet®, America’s #1 choice in gutter protection for more than 30 years. The brand’s commitment to product innovation and refinement echoes our own dedication to quality workmanship and customer care. With Gutter Helmet®, you get the ultimate in gutter protection without ever having to climb up a ladder. That’s 24/7/365 protection from clogged gutters, leaky roofs, cracked foundations, damaged siding, peeling paint, mold and mildew, and much, much more! Get in touch with Gutter Helmet® of Kansas at (800) 824-3772 or fill out our online form to receive a free, no-obligation quote. We look forward to giving you the quality gutter protection and the peace of mind you and your household deserve.